Two papers on modulation by Tom Bridges and Dan Ratliff (Loughborough) have been accepted for publication. 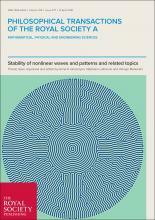 The papers address a problem which has been unsolved for over 50 years: what happens to a nonlinear wave when the Whitham modulation equations, evaluated on the wave, break down? A new nonlinear and universal theory is developed in these papers. The first and main paper “On the elliptic-hyperbolic transition in Whitham modulation theory” has appeared in the SIAM J Applied Maths (link here) and the second, which generalises the theory to multi-space dimension, “Nonlinear modulation near the Lighthill instability threshold in 2+1 Whitham theory” has appeared in the Philosophical Transactions of the Royal Society (link here).